(10:08:58)sunshineormer与所有人说:Should the Account Object be exposed? in 《Pojo in action》 , "accountid" is used in "service"
(10:13:44)sunshineormer与所有人说:what kind of work you have done between security (role, authentication) and domain? (10:19:29)*umlchina2与*umlchina2说:1) Wang Gang: Which domains have you ever practiced your approach in? Please give some cases. (10:20:48)sunshineormer与所有人说:In domain modeling approach, there are 2 methods. One is DDD's suggestion. (10:21:21)sunshineormer与所有人说:such as 《The Data Model Resource Book》, it suggests to do business modeling with wider view. (10:21:52)sunshineormer与所有人说:such as the “coordination system”，just like IBM “On demand”. (10:22:10)sunshineormer与所有人说:This will request the good relationship of the enterprise with suppliers and distributors. (10:22:22)sunshineormer与所有人说:Would you please comment on this? 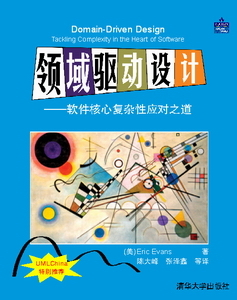 (10:26:03)sealw与所有人说:Dear Eric, did you read Peter Coad's "Color UML"? (10:29:39)sunshineormer与所有人说:Fig 16.20 is not the same as the one in Martin Fowler's book 《UML distilled 3ed》. (10:30:13)sunshineormer与所有人说:Would you please tell us who is right? (10:30:28)sunshineormer与所有人说:There are both about the modeling to Employee and retire plan, but the model is different. (10:36:41)sunshineormer与所有人说:Can you give us a brief on the latest research on DDD? (10:37:15)sunshineormer与所有人说:DDD", Can you tell us something detail about it? (10:40:49)sealw与所有人说:but it seems that XP do not has front domain design, how do you think about this question? 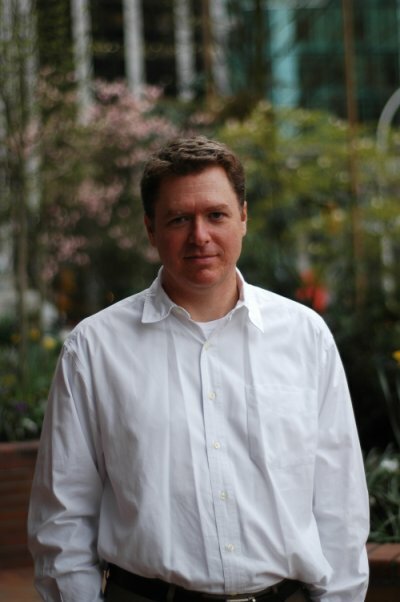 (10:40:56)skysoftboy与所有人说:dear ERIC EVANS:domain driven design is connect with the domain modeling? (10:44:35)sealw与所有人说:In Peter's color book, he suggest FDD, which has a front domain design. (10:45:19)sealw与所有人说:But in XP, it seems not to has such front design, how do you think about this? (10:47:03)*umlchina2与*umlchina2说:正在谈"Three practical steps towards DDD"
(10:56:39)*umlchina2与*umlchina2说:现在的问题:sealw与所有人说:But in XP, it seems not to has such front design, how do you think about this? 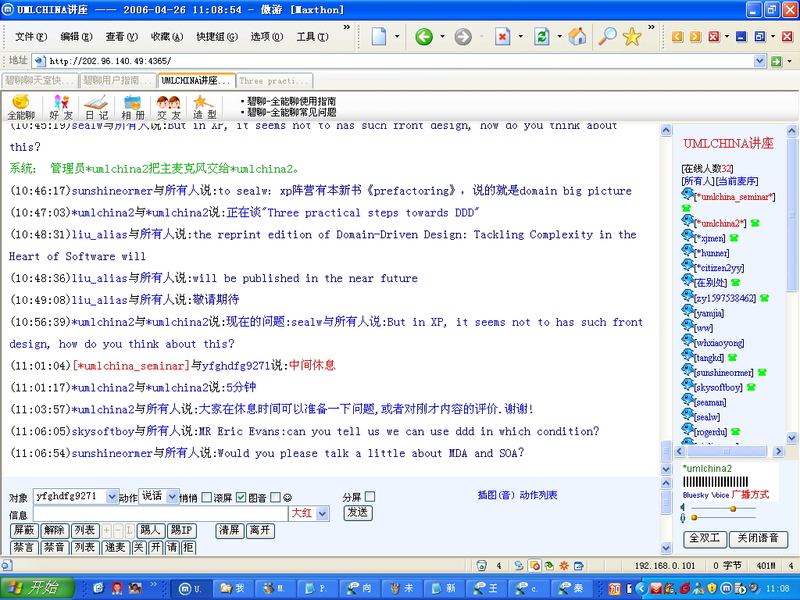 (11:06:05)skysoftboy与所有人说:MR Eric Evans:can you tell us we can use ddd in which condition? (11:12:25)skysoftboy与所有人说:and can you talk something about it?just like use it in Bank field?thank you ! (11:19:03)skysoftboy与所有人说:Dear Eric Erans:Could you give us your E-main? (11:22:47)skysoftboy与所有人说:Mr Evans:In J2EE,i get a concept of Common Domain Modeling,it's the same means with DDD? (11:23:06)9foryou与所有人说:Dear Eric Erans, Which business will DDD well apply? (11:31:38)sunshineormer与所有人说:You seems to be very busy since we rarely see you at ddd discussion group. (11:31:43)sunshineormer与所有人说:Hope you will be able to visit there often. (11:50:34)skysoftboy与所有人说:OK thank you to come to here at the end...thank you very much!! (11:52:25)*umlchina2与所有人说:3) Ma Ziyang: How to choose supple software architecture model? Is there any mature model? (11:53:47)*umlchina2与所有人说:5) Zhang Yun: What are the advantages of DDD?